I really wanted to get a good photo of Wigs and Sylvester to hang up on our gallery wall, but when it comes to taking pictures of these two furballs (especially with our phones) it can be totally hit or miss. So, I decided to set up a full-on photo shoot with lights and everything to get the type of photo I really wanted. I realize that's *definitely not* a crazy statement at all, haha, but I thought it would be fun to share a semi how-to with some tips we've learned along the way. And of course, I'll include some of the ridiculous outtakes. So, here we go! Step 1 - Put them on a table. (Make sure it's not too tall so if they do jump off they won't hurt themselves). After lying on the ground trying to take photos of the cats and having them constantly run off Will had the idea of setting them up on a table so there wasn't as much room to move. Without the ability to wander they focused on the kitty treats and toys we are holding above them. 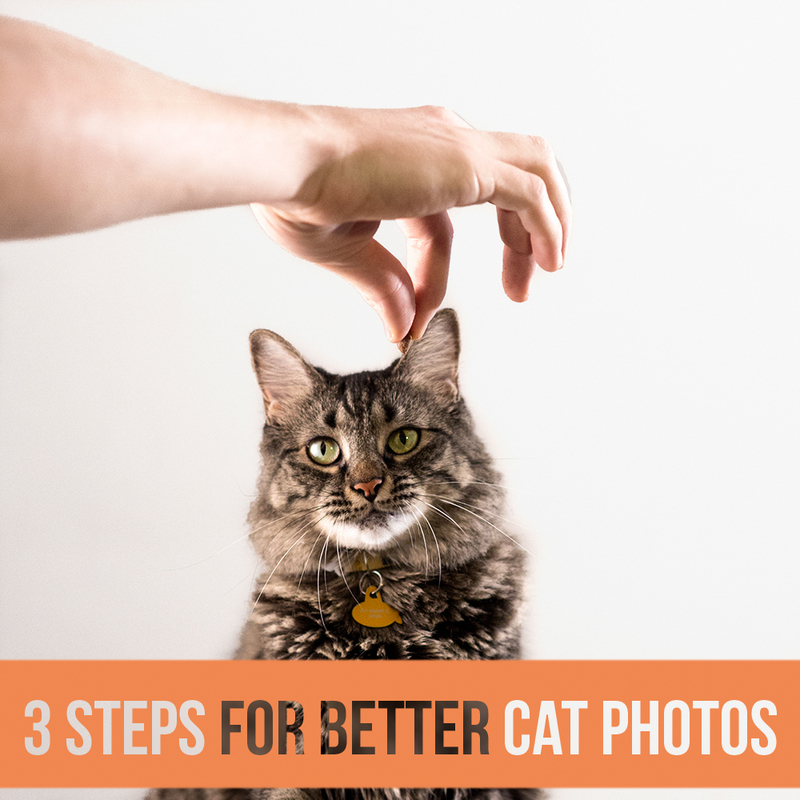 Step 2 - Put camera on burst mode and hold that shutter down. TAKE ALL OF THE PHOTOS, haha! Make sure to just keep clicking away, because in between all those goofy faces and sometimes blurry photos there can be a gem or two. However, I am pretty partial to those goofy faces. They make some wonderful photos too, case in point Sylvester's goofy face up above, haha. It hardly looks anything like him. Step 3 - Treats and Toys. 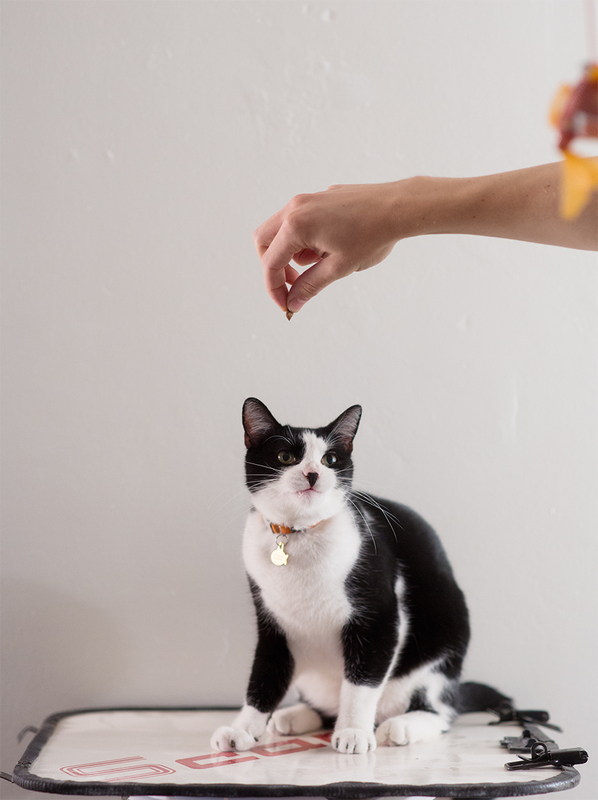 Bribe the heck out of your feline friends! Treats and toys are a must unless your cat is totally amazing about sitting and looking at the camera, which my two are most certainly not. 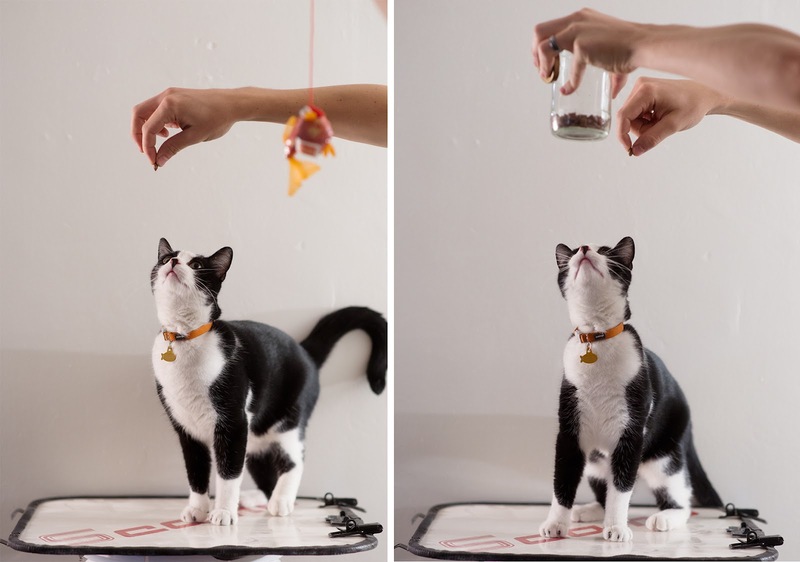 You can frame the shot so the treat/toy holder's hand can easily be cut out, or you can always leave it in like we did with our final product. We got the final image printed from Tiny Prints and I think the end results came out pretty darn wonderful. I am so in love with Wigs' face which is basically saying 'what? all I get for this is that stupid treat?' haha. We are still working on our gallery wall, but I think this image is the perfect addition for sure. 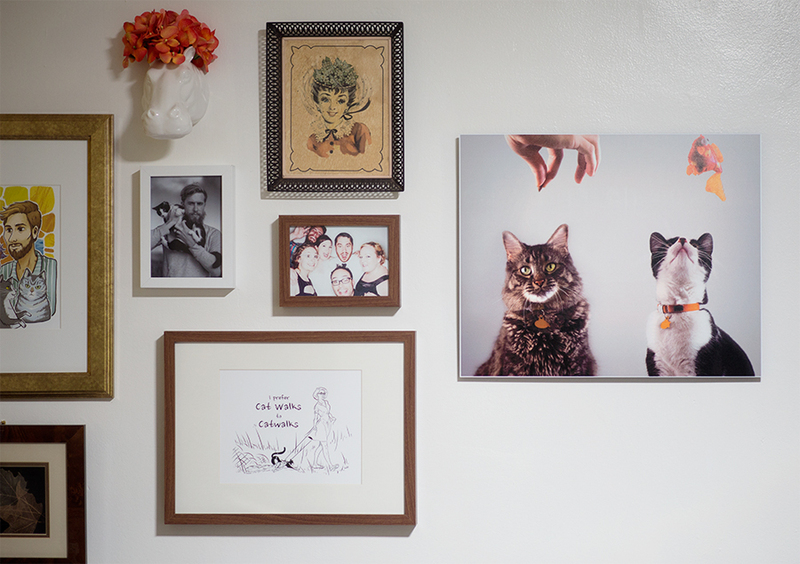 How could an image of your pets not be perfect on your walls?! What do you guys do to try to get the best photo of your pets?